Net Contents: 8.5 oz./ 250 g. Glass size: 3" x 4". 【 CLASSIC CANDLE】The classic scented candles set contains 3 different 8.5 ounce candles. Scents include Peach, Lemongrass, Lilac. Glass Jar size: 3" x 4". 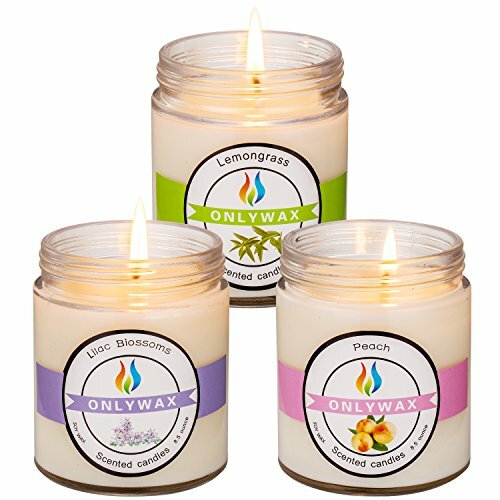 【SAFE AND ECO-FRIENDLY】 - Non-toxic and featuring a 100% soy wax and cotton wick. so you can feel good about enjoying the warm, flickering glow of these candles with your family. 【THE PERFECT GIFT FOR ANY OCCASION】 - These are perfect for adding a decorative touch to any room's decor. Each of which burns clean for 50 to 60 hours. The subtle jar design makes it the perfect complement for any decor, and any room of the house - kitchen, bedroom, bathroom, family room, great room. 【A TREAT FOR LOVED ONES】- Very effective at ridding a space of other odors.Effective against cigar, cigarette, pet odors.When you're done with the candle, you can reuse the jar for candy, pet treats and anything in between. 【100% SATISFACTION】 - If you are not completely thrilled with the fragrance or appearance of these candles, just ship them back (at our expense) and we'll give you a full refund. No hassles. No headaches.